Internally displaced children, victims of conflict in Colombia. Hostilities in Colombia have disrupted the lives of more than a quarter of a million children since peace talks began three years ago, the United Nations children's agency today reported. Of that figure, nearly 230,000 have been displaced and an estimated 1,000 children were used or recruited by non-State armed groups, according to the latest report from the UN Children's Fund (UNICEF) http://www.unicef.org/media/files/UNICEF_Colombia_Child_Alert_March_2016_FINAL%282%29.pdf">Childhood in the Time of War: Will the children of Colombia know peace at last? “As peace negotiations to end half a century of war in Colombia continue, it is crucial to make children's interests and protection a priority,”said Roberto De Bernardi, UNICEF Representative in Colombia. The report comes just days before a reported deadline to reach a final peace deal between the Government of Colombia and the Revolutionary Armed Forces of Colombia-People's Army (FARC-EP). If successful, the deal would end the longest running conflict in the Americas. It would also start operations of the newly approved UN Mission in Colombia, which will monitor the ceasefire, at the request of both the Government and the FARC-EP. Even if the peace agreement is reached soon, “children will continue to be at risk of all kinds of violations including recruitment, landmines and sexual exploitation,” said Mr. De Bernardi, calling for material and psychological assistance for these children. The report highlights that forced displacement, insecurity, fear of recruitment, the threat of sexual violence and the presence of antipersonnel landmines are causing school-aged children to drop out of school. In addition, schools have been damaged or destroyed during the fighting, and at least 10 teachers have been killed, according to the report. “Unless conflict-affected children have better opportunities, joining other non-State armed groups will be their only hope to survive,” UNICEF said. The UN agency also called for the release of every child below the age of 18 from armed groups, irrespective of the outcome of the peace agreement. 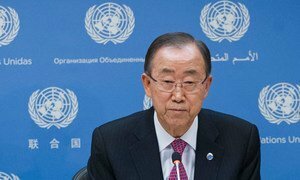 The United Nations political mission that is being deployed in Colombia will be an “unprecedented experience” in the country, as well as in the history of UN ceasefire observations, Secretary-General Ban Ki-moon has said.